Shower tiles tend to get incredibly dirty with time, and cleaning those rippled surfaces without proper equipment could prove to be incredibly tedious. Thankfully, we’ve rounded up the most popular shower squeegees on the market in order to help you decide which one to get for your shower tiles. It doesn’t matter if your tiles are uneven or if your shower is slippery, we’ve got your back. Tile shower stall with squeegee hung on the wall. We have concluded that the Good Grips Stainless Steel Squeegee by OXO appears to be the most advantageous buy at the moment, but remember that we’ll be giving you an overview of each product and it’s up to you to choose which one you prefer. 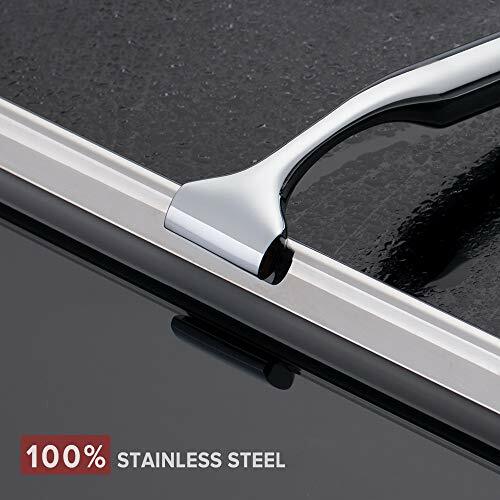 This practical, stainless steel squeegee works well on a variety of different surfaces, and its material allows the product to stay free from rust for a long time, even when kept inside the shower. It offers a rubber grip as well, which keeps your hands from slipping when cleaning your tiles. You can also use it to clean glass! In some cases it might seem like black plastic blades could cause the tiles to stain, but it’s not such a common issue and it could depend on the quality of the tiles rather than the squeegee itself. Although the product quality seems to be really good in general, the fact that OXO doesn’t offer replacement blades could feel like a huge disappointment for some buyers. In any case, OXO’s product appears to be an effective and durable choice! Good quality product allows you to properly clean glass and tiles. Rubber gripping keeps the squeegee from slipping too often. Stainless steel should help the squeegee stay free from rust for a long time. No replacement blades mean that whenever the product starts losing its effectiveness, you’ll have to buy a new one entirely. It could stain certain types of shower tiles. This product isn’t as flexible as OXO’s design, but it still manages to offer good quality to its buyers. It works on most surfaces and its usage isn’t limited to shower tiles, so getting your hands on this product might be a good idea if you intend to use the squeegee around your house. It also offers two replacement blades, which most people would judge as a great deal when compared to the price of OXO’s product. The handle should allow comfortable usage of the product, but keep in mind that it could prove to be a bit small for some owners. The one main issue that seems recurrent is that the squeegee’s cleaning blade isn’t really as flexible as advertised, and when cleaning it could feel stiff at times. It could also leave moisture trails depending on the ripple consistency of the surface you wish to clean. Works on most surfaces without issue. Offers replacement blades, which could save you decent money after wear and tear start to kick in. The squeegee seems very practical and easy to use. Blade design could leave trails when cleaning. Flexibility doesn’t seem to be as good as advertised, but it can still work its way around most surfaces. Not ideal if you’re looking for a large squeegee, given its relatively small size. Quintis’ product is entirely made of stainless steel apart from the cleaning blade, which one could say it’s a very good thing considering its rust resistant properties, but it can also feel very heavy when cleaning. The material also tends to make a lot of noise with normal movements, which might feel a bit annoying from time to time. In any case, it does seem to offer more positives than negatives. This squeegee is extremely versatile and works for many different surfaces; the product is well made and performs at a higher level than other options in the market. Although it doesn’t offer replacement blades, the rubber seems to be very durable and shouldn’t wear down easily. The stainless steel offers both a slick look and great resistance to rust. Versatile squeegee that seems to properly clean most surfaces comfortably; it should work well around the house. It appears to be a high-quality tool and worth investing money in. Cleaning rubber blade seems to last for a long time. Good enough size allows comfortable cleaning. It could feel a bit heavy when cleaning. Steel could generate too much noise and owners could find it annoying at times. The Jet Clean Squeegee Cleaning & Washing Kit includes two professional tools: the washer and the squeegee with a scraper. The kit features a 13.5 inch-wide washer that has high-quality microfiber and the Power Scrub Strip, together with the squeegee and scraper of the same width. This kit is effective in cleaning shower tile, windows, and other glass surfaces. Its large and flat cleaning surface is coupled with the microfiber material and Power Scrub strip, removing dirt conveniently and quickly. The design is made to perform better than other products with curved or round cleaning surfaces. The 13.5-inch squeegee comes with an attached metal scraper. First, the rubber squeegee removes any water or liquid, gets rid of water spots, and then the curved metal scraper removes the grime and any tough dirt left. There are multiple ways to clean using this kit. The squeegee handle is designed to fit and lock into the washer handle – which means you can nest the two tools together. You can have them facing the same direction to double cleaning action, or have them face different directions to get more room and control when cleaning. You can also use them as individual tools. The Unger Professional Performance Grip Squeegee is designed to be bigger than others in the market. At 18 inches, it is preferred by many commercial establishments. If you want to experience a fast and strong cleaning time, try this out. 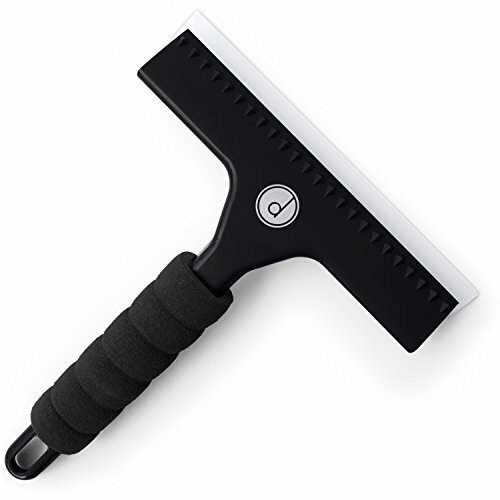 The squeegee is made of high-grade rubber blades that can clean the biggest surfaces. It’s very easy to use despite the size and promises no streaks or leaks. 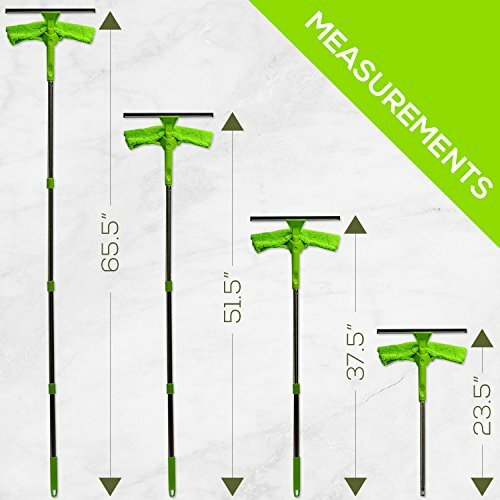 You can attach it to the brand’s telescopic pole, which is sold separately if you require more reach. It will last for a long time because it’s made of stainless steel that is rustproof, too. The handle won’t cause strain because it is designed ergonomically. It’s actually quite comfortable to hold. 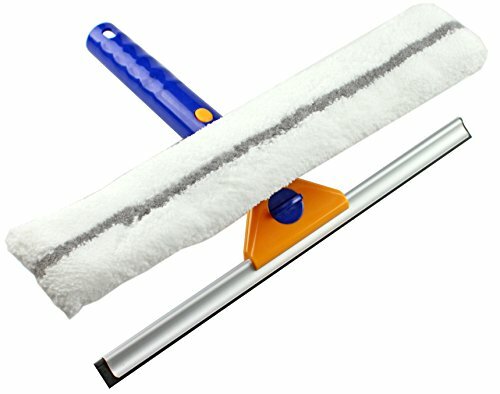 The Ettore 12-Inch ProGrip Squeegee is available in different sizes to fit the needs of different homes and bathrooms. It is crafted with high-grade rubber and a comfortable, ergonomically designed no-slip handle. You can use the brand’s REA-CH extension arms, sold separately – if you need more reach when cleaning. It can work on multiple surfaces: shower and bath tiles, windows, and glass surfaces. It’s quite small and easy to maneuver, transport, and store. 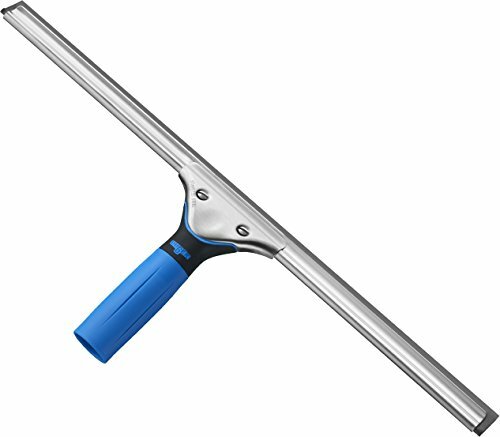 This Modern Domus Neverending Reach Squeegee lives up to its name: it comes with an “endless” extendable pole that gives you a wider, higher reach. Does your bathroom have high ceilings? No need to get on top a chair just the clean the tiles all the way to the top. Plus, the kit includes four different washer heads, for different washing needs. A bonus replacement microfiber cloth is also included. The tool in itself is very lightweight. So if you’re thinking, okay – this one is long and can reach high places, but can I carry all that weight? The answer is yes – thanks to the lightweight materials used to craft the pole. There is no compromise to its sturdiness, though. You can go from 15 inches to 65.5 inches in no time. And if that height is still not enough, you can purchase extra pole sections from the same company. The squeegee comes with two heads – one at 8.2 inches, and another at 12.2 inches. There are two microfiber heads of the same sizes, as well as microfiber cloths. If you need more, you can purchase more from the same company. These microfiber cloths are absolutely machine washable. After cleaning your bathroom tile, window, or glass, just toss them into the washer and that’s it. The extension pole can be pulled apart easily when not in use, which makes for better storage. You can even keep it in your car’s trunk if you’re traveling. Squeegees are usually kept inside the shower or in the bathroom, so being able to withstand water and vapor are crucial features to have for one of these practical tools. The longer it manages to stay rust-free, the less you’ll have to worry about getting a new one. The product’s size needs to be large enough to allow users to comfortably clean around, but it shouldn’t be too big to make cleaning a nuisance. An average, decent sized squeegee is an ideal addition as a cleaning tool. Although the easiness to use goes hand in hand with size, it’s actually defined by a wider set of attributes. 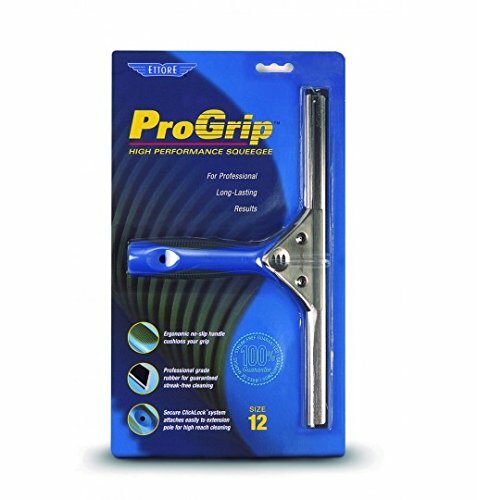 The practicality of the grip, the sliding capabilities of the squeegee itself and the quality of each ‘slide’ will ultimately make a huge difference and define how easy the product is to use. A big factor of ease of use comes with the weight of the actual tool. The more lightweight it is, the easier it is to handle. Shower squeegee for uneven bathroom tile. 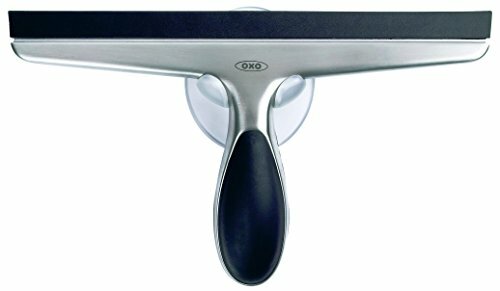 The Good Grips Stainless Steel Squeegee by OXO seems to be one step higher than its competitors considering how comfortable it seems to be and how easy it is to clean with it. In any case, other options are still worth considering and you should take a peek on each product yourself to see which one you’d prefer! If you’re looking for ways to improve your bathroom or shower area, if you have slippery shower tile and are frustrated with your shower curtain rode not staying up…be sure to read our reviews shower curtain rods that work well on smooth tile. You might find exactly what you’re looking for over there!